On Cousin Island Special Reserve, Nature Seychelles staff and volunteers complete two main seabird censuses annually, coinciding with the two different monsoon seasons. 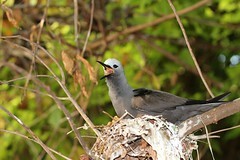 At these times censuses are conducted for the year-round nesting birds, such as White-Tailed Tropicbirds (Phaethon lepturus), Tropical Shearwaters (Puffinus lherminieri), and White Terns (Gygis alba). During the southeast monsoon season, Lesser Noddys (Anuous tenuirostris) are included in the census as well. These have been carried out for over ten years, allowing trends of the various species to be monitored. If you ever visit Cousin, you’d be utterly amazed at the amount of birds that occupy the island, especially when the noddys are around; it’s challenging to find a single branch without a nest on it. Once the noddys leave, the island shifts focus to sea turtles and to the beaches. However, it is also time for the Wedge-tailed Shearwaters (Puffinus pacificus) to breed, and this year, the Bridled Terns (Onychoprion anaethetus) as well. The Wedge-tailed Shearwaters arrive as early as May, scouting out burrows, but don’t actually start laying eggs until September or October. Wedge-tailed Shearwaters can be found on the open hill, granite boulders and bare earth, therefore making a population census a bit more challenging. To add to it, they forage during the day and return to their burrows at night; therefore it’s crucial to do population counts at night in order to have an accurate estimate. The breeding colony has been mapped out for Cousin in the past, and 50 random plots were chosen as a subsample of the breeding population. These plots were visited at night by mixed teams of fully trained Cousin staff and conservation volunteers. Following a methodology set by Burger and Lawrence (2001), every potential burrow was searched within a predetermined radius, the contents were recorded – eggs, adult and egg, adult, predated egg, and so forth. A shearwater recording was played in order to determine if birds were being missed. Spending many evenings wandering the hills under the stars sounds like pretty easy work; it is not. The rewards are seeing the forest in a whole different light (no light to be exact), surrounded by shearwaters and their eerie calls. Bridled Terns lay a single egg in boulders or within ground vegetation, making them difficult to find. They have synchronized breeding seasons of 7-9 months (Diamond 1976) and their most recent breeding season fell at the end of October. Due to differences in behavior, compared to Wedge-tailed Shearwaters, the Bridled Tern census consists of methodically searching their known breeding areas at dusk and using a clicker to get an estimate of the whole colony (Burger and Lawrence 2003). This year, we estimated 16,145 breeding pairs for the Wedge-tailed Shearwaters, which when compared to 2014 (Burt 2014) and, 1999 (Burger and Lawrence 1999), the population numbers are very alike. Methodologies for these three years were similar allowing a good comparison to be made. The Bridled Terns on the other hand make up a much smaller breeding population, and their numbers have stabilized over the past three years. Long term monitoring is crucial for detecting trends in the size of seabird populations, and this population monitoring, along with monitoring breeding populations, is one of the most important parameters for monitoring seabirds (Burger and Lawrence 2003). Without that information, it is hard to determine whether populations are increasing, decreasing, or stable.